Training courses by heritage for all. We are also delighted to welcome Hameed to our volunteer team, and thank him for his hard work and time. 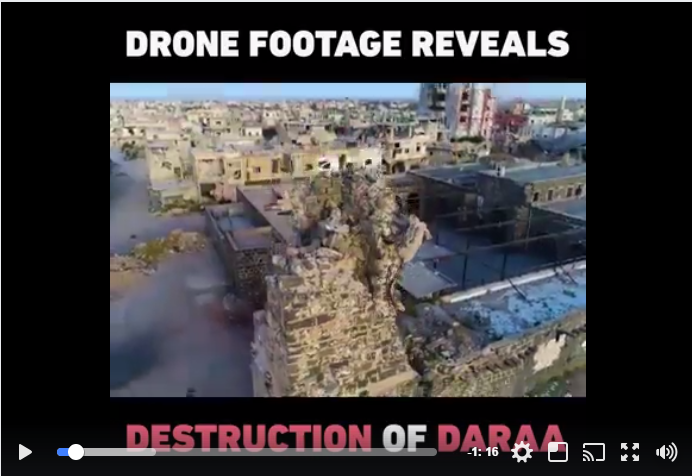 Drone footage damage in Daraa, starting with an overview of the historic Omari Mosque, from a video by Middle East Eye, shared on Facebook by Misc Horanih . Aleppo Archaeology Facebook page shared a post depicting a picture of a damaged historic house (collapsed roof, fallen debris, etc.) from the Al-Amalji neighborhood. The picture has been credited to Mahmoud Sakeet. The Aleppo Archaeology Facebook Page shared a post depicting a picture of a damaged stone built minaret, called the Adiliya Minaret. It seems to show a large hole in the side of the minaret’s shaft. The Syrian Arab Army liberated the ancient site of Resafa from ISIS: the city was known in the Roman and Byzantine era as Serigopolis. According to the DGAM, through initial assessment of the damage, some of the outer walls of the castle are destroyed by shells and clashes, and in general the technical condition of the site is good. The Authority for Tourism and Preservation of Antiquities issued an appeal to the relevant institutions to intervene and protect the Samaan Castle (St Simeon’s Basilica, part of the UNESCO World Heritage site Ancient Villages of Northern Syria) that has been used by various sides within the Syrian Civil War, in defiance of The Hague Convention of 1954. The USA’s House Financial Services Committee’s Subcommittee on Terrorism and Illicit Finance held a hearing on June 23 about “The Exploitation of Cultural Property: Examining Illicit Activity in the Antiquities and Art Trade.” View the webcast on the Financial Services US government website. The Aleppo Archaeology Facebook Page shared a post reporting a missing rock of holy importance to the Muslim community. According to the post, the rock held a mark of Prophet Muhammad’s left hand, and it was placed in the mosque’s wall. The rock was located in a mosque in Aleppo, and its date of theft was not reported, however it was last seen in December 2016. Pictures of the rock can be seen on the page, including the a picture of the wall after its theft. According to the Medmak Syrian Archaeologist Study Center, the International Council of Museums (ICOM) issued a new Emergency Red List of 33 Syrian Antiquities. They include items stolen from Maarat al-Nu’man’s Museum and the National Museum of Damascus. The date of the report is unclear. The Ministry of Culture is launching a new project to protect world and Syrian cinematic heritage. The Dead Cities, a UNESCO World Heritage Site, are a group of abandoned villages in northwest Syria, built between the first and seventh centuries. Some of the oldest surviving Byzantine churches are among the ruins. The archaeological sites are now used by displaced people for homes. Hekayya is an outreach effort supported by the Safeguarding the Heritage of Syria and Iraq Project, which aims both to protect cultural heritage and to assist these refugee communities. Read more in the Penn Cultural Heritage Center newsletter here. The Syrian Association for Preservation of Archaeology and Heritage, in cooperation with Qibaa Architectural Studio, and the Molham Team, released a video in a Facebook post revealing a new initiative this Eid Al-Fitr to produce a series of heritage-themed games for 1500 refugee kids. According to the groups involved, these games will hopefully address the lack of bonds these kids have with their country’s history and heritage. The first games to be produced will be puzzles of 8 pictures of The Umayyad Mosques in Damascus and Aleppo, with information on the country’s great historical figures. To donate to this campaign, please click on the following link. The Authority for Tourism and Preservation of Antiquities, in cooperation with the Department of Antiquities in Kobani repaired damaged mosaics that were retrieved from the archaeological site of Tell Shiyukh Tahtani. They also met with UNESCO in Beirut to discuss how to develop cooperation in protecting Syria’s cultural heritage (read more here). Reconstruction continues in Old Aleppo today – Despite the destruction of many ancient buildings, most of the old rocks have been recovered. See pictures on the @MmaGreen’s Twitter account here. The Lebanese Newspaper al-akhbar, published an article reporting a botched restoration of a historic building in Aleppo. The building was first built in 1910 as the headquarters for the Ottoman Agricultural Bank, and since then has changed its purpose several times until its most recent use as a restaurant. Civilians rescue books for a public library in Inkhil, “one of the most important ancient towns in the Houran Plain and one of it oldest inhabited cities.” Read more on the News Deeply website here. The dialogue included discussion of culture, heritage, and claims that the “deliberate destruction of historical and cultural heritage, were not being adequately documented.” Read more on the OHCHR website here. The summary of the presentation of reports of the Secretary-General and the High Commissioner for Human Rights, and the start of the general debate on the promotion and protection of all human rights, civil, political, economic, social and cultural rights, including the right to development, which the Council started on 20 June, can be found here. This project aims to train Syrians in digital documentation techniques in order to digitally document heritage sites at risk. Learn more on the British Council website here. This is a new heritage conservation training program for Syrian refugees and Jordanians. The project will also include innovative cultural education activities with public school students and teachers in order to build awareness of the value of cultural heritage to the daily lives of local communities. Learn more on the World Monuments Fund website here. This project will provide a group of Syrian and Jordanian trainees with traditional stonemasonry skills that can be used to repair conflict-affected heritage buildings. Learn more on the British Council website here. The Victoria and Albert Museum will host a panel on “Memory & Authenticity: Cultural Protection in Conflict.” June 30, 15:30-1730. More details on the V&A website here. ICONEM starts an ambitious survey exploiting the immense visual documentation collected on the site. More than 50,000 photographs of the monuments of the ancient city, taken from the ground and with the help of drones, are the data collected by the teams of the General Directorate of Antiquities and Museums of Syria and Iconem. Read more on the ICONEM Tumblr here. The Italian High Institute for Conservation and Restoration has reconstructed two tomb figures from Palmyra using old photographs and 3D technology. Read more on the Deutsche Welle website here. The New Mexico History Museum (Santa Fe, USA) is opening a new exhibit about Syrian heritage and culture. “Partnering with Curators Without Borders, the exhibition highlights the vast collection of albumen prints, showing not only the historic sites now destroyed in Syria, but representations of its people in adjacent collections within the Photo Archives.” Syria: Cultural Patrimony Under Threat, June 23 – December 2017, 113 Lincoln Avenue, in Santa Fe, New Mexico. Learn more on the NM History Museum website here. A $1.1m grant, announced last month, supports a three-year project to widen access to this 3D data, so that it can be used by troops on the ground and scholars via their laptops anywhere to assess the condition of monuments and sites at risk.For more information see here. Syrian musician Badr Rami performs at the Mawazine Festival 2017 in Morocco and discusses the importance of musical heritage. Read more on the National website here. The Evening Standard interviews Syrian choreographer Mithkal Alzghair about his art and heritage. Syrians share their heritage at the DiverseCity Multicultural Street Festival hosted by the P.E.I. Association for Newcomers to Canada (P.E.I. ANC) in Charlottetown. Heritage for All is offering several training courses in July 2017. Course: Social Approaches to Archaeological Heritage – Workshop. 29 July – 7 August 2017. A video from Voice of America discusses Syria’s agricultural heritage. “Just south of Aleppo there was once a research center where Syria’s agricultural heritage was preserved with a view to helping feed the world. The seed bank may have been abandoned due to the country’s civil war, but efforts of scientists and farmers now continue.” Watch the video on the VOA website here. Smartwater is an undetectable liquid that can be used to protect cultural artifacts. The SmartWater Foundation is in the news again, emphasizing their ability to protect sites from looting. Read more on the Antiquities Coalition website here. New art projects at the Pratt Institute in New York examine “stories of migration, displacement, identity, family, and heritage, the events revealed some of the complexity of experiences and stories of the immigrant community,” including focus on Syria. Read more on the Pratt Institute website here. The Aleppo Project publishes an article in which Dr. Kinda Alsheikh Ali paints a picture of the public park of Aleppo as it once was – its beauty as a place that brings people together, in the past and hopefully in the future. A new article on the Geographical website discusses cultural heritage destruction during times of conflict. The deliberate destruction of heritage is a war crime. The Los Angeles Times talks with a Syrian shopkeeper about his decision to return to Palmyra. Charles Glass shares a remarkable story of reconstruction, tourism, and hope in Syria. Read the CG article here. Syrian Following the destruction of the al-Nuri Mosque of Mosul, Al Jazeera asks “What can be done to stop cultural genocide?” Watch the 25 minute video on the Al Jazeera website here. The Hindu website publishes an overview of major heritage sites that IS has destroyed, including those in Syria. Read more on the Hindu website here. The Antiquities Coalition’s “Culture Under Threat” map provides an interactive view of heritage sites which have been attacked and/or are in danger now.